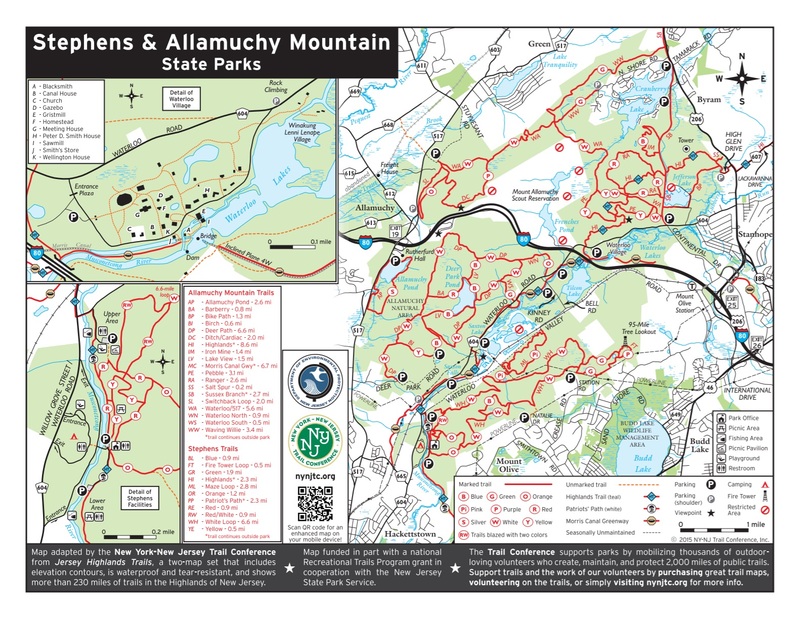 For full map of the area, see "Jersey Highlands Trails" in our map store. Length: 10.5 miles Click on the icons in the text below for photos. From U.S. 206 opposite the shopping center north of Lackawanna Drive, proceed along Hi Glen Drive about 300 feet. Turn left on Francis Terrace, then follow it to the right as it becomes Drexel Drive. Bear right after a sign saying "Norman Terrace", reaching a parking area at 0.2 mile. Enter a gravel bike path, cross a bridge, and then turn right into the woods, crossing well-preserved rock walls and small rocky ridges. At 1.2 miles, enter the northern fringe of a mining area with many large rocks, and some tailings and pits. At 1.5 miles, cross a stream on a bridge and continue to the Sussex Branch Trail (formerly DL&W RR Sussex Branch) at 1.6 miles. Turn left onto the Sussex Branch Trail for about 100 feet, then bear right onto a narrow, raised level trail. Here you are walking on a fragment of the Sussex Mine Railroad, which pre-dated the Sussex Branch of the DL&W RR. Mules once pulled iron ore carts along this narrow-gage RR. After 100 feet, turn right onto a narrow footpath and ascend a hill. At 1.9 miles cross a dirt road. Skirt a large depression, and continue to a multiple-use trail at 2.5 miles. Turn left onto this trail and follow it for 0.1 mile, then turn right, crossing a dirt road in about 250 feet. Cross a stream, skirt a wetland on the right, and continue to a multi-use trail at the top of an ascent, at 3.3 miles. Continue straight ahead. Old white blazes appear on this section along with the Highlands Trail blazes. At 3.5 miles, turn left, leaving the white blazes which bear right. Descend about 200 feet to a lookout, where you can see Waterloo Lake and the Musconetcong River. To the left is the International Trade Center; to the right the Pohatcong and Jenny Jump ridges are visible. Make a sharp right, and continue along the face of the mountain, descending to Waterloo Road at 4.4 miles, where there is parking. Cross Waterloo Road and follow the blazes across several fields and down to the Musconetcong River. Turn right and pass under Interstate 80 where the highway crosses the river. Pass through a scrubby area and come out to the Morris Canal tow path. Follow the tow path out to Waterloo Road. Turn left on Waterloo Road (the road has obliterated the tow path here) and in 300 feet, bear left off of the road onto the Morris Canal Towpath again. Parking is available in this area. In this section, the Musconetcong River is on your left, and the old canal bed on your right. Cross Kinny Road at 5.2 miles. At 5.7 miles, turn right off the towpath about a hundred feet to Waterloo Road. Turn left onto Waterloo Road. At 5.9 miles there is parking. At 6.0 miles, turn right onto the old Waterloo Road. In this section, the canal and towpath have been obliterated by the present Waterloo Road. Rejoin Waterloo Road at 6.2 miles. At 6.8 miles, turn left off Waterloo Road onto Sunrise Parkway - a small residential street. Make the first right onto Colony Road. NOTE: At the time of this writing, there were no street signs on these roads. 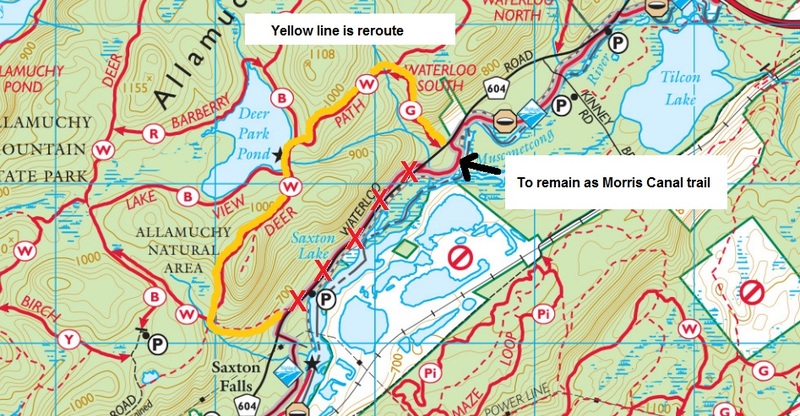 Follow Colony Road back out to Waterloo Road, reaching the Saxon Falls historic area at 7.5 miles. After walking past the restored lock and through the parking area, cross Waterloo Road and turn right off the road, then a quick left onto the Morris Canal towpath. Turn left off of the towpath just before a house, and turn right again onto Waterloo Road. At 8.1 miles,cross the New Jersey Transit Hackettstown railroad line. At 8.2 miles, turn left onto Waterloo Valley Road. Cross the bridge, and turn right into Stephens State Park, where there is parking. 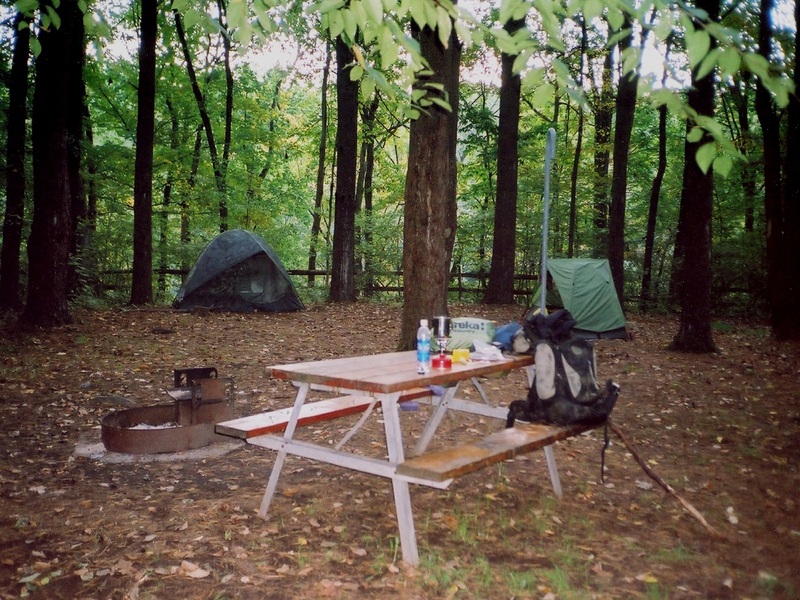 Camping is available at Stephens State Park. Follow the co-aligned Highlands Trail and Patriots Path past a little island, then bear right on the co-aligned Highlands Trail/Patriots Path/red trail. After a short distance, turn left and go up a few steps to the Highlands/yellow trail and turn right. Follow the Highlands/yellow trail out to a second parking lot at 8.7 miles. Pass a small ranger station and a gate, then follow the park road to where the pavement ends at 9.2 miles. Continue through the picnic area, then continue on a narrow trail along the river to a "Y" at 9.8 miles. Bear left and angle up the hill along an old road. Turn left off of the old road and up through a series of switchbacks, reaching a level area at 10.3 miles. Cross a faint woods road, then come out to Mine Hill Road at 10.5 miles.